As I'm sure you'll have noticed by now, I have a bit of a thing for red-black nail polishes. I seem to have bought quite a lot over the last few months, and I'm always on the hunt for the perfect shade, not that I know exactly what I'm looking for, I just hope that I'll know when I see it. My latest addition to my red-black collection is Black Dahlia from OCC, which shares its name with the Lip Tar. Black Dahlia is one of the nicest creme polishes in this colour family that I've ever used, it's wonderfully pigmented meaning that you could get away with just one coat if you applied it slightly thicker, but for the photo here I used two thinner coats. It's also super smooth and glossy, I haven't had to use top coat for this photo, and unusually, I didn't feel I needed Seche Vite for drying time either. This is easily one of the fastest drying nail polishes I've ever used, by time I'd finished my second hand, my first one was dry. I really enjoy the brush that OCC use, it has a pinched ferrule so there's a flat side to the brush, making application a breeze especially around the cuticle. This is one of my favourite polishes I've ever featured in a Manicure Monday post, and my only complaint is that OCC don't seem to have a UK stockist for their polishes, meaning you have to rely on getting them shipped from the US. Thankfully my brother picked this up for me while he was there, because the only sellers I've found on eBay have massively hiked up the price. If you can get your hands on an OCC nail polish I'd definitely recommend giving at least one a try, I'm sure you won't be disappointed. 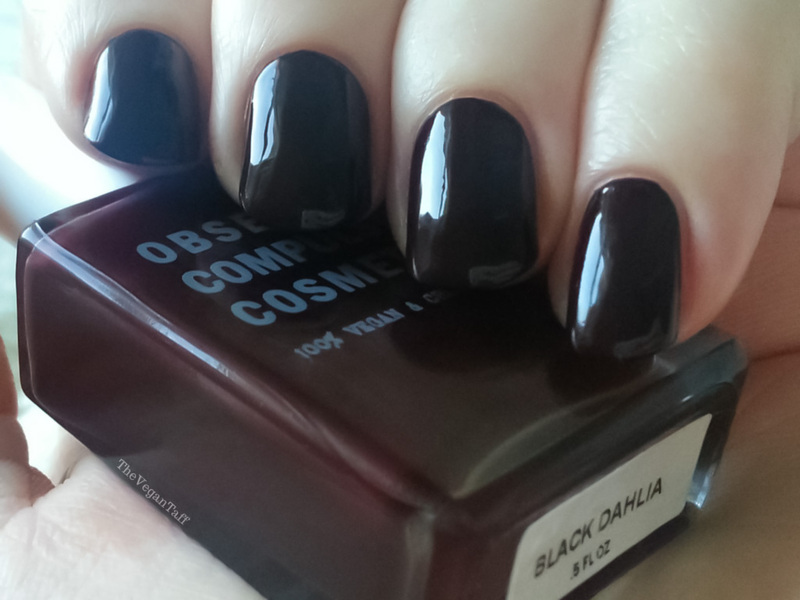 OCC Black Dahlia nail lacquer is available from the OCC website or Sephora for $10. What do you think of this shade? If you know of a UK stockist please do let me know, I'd love to get more shades.